Some of you eagle-eyed readers may have noticed the name of this recipe: “Ground Corn Bread”. I know, it’s a little awkward, but there’s no other way to put it, really; it’s not cornbread. But what it is exactly depends on where you’re from. 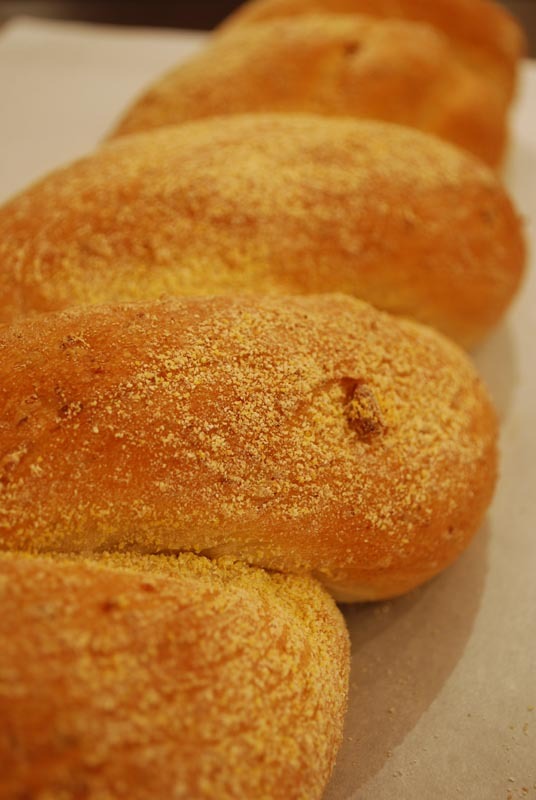 This bread is made from coarsely ground corn, not cornmeal, which (though it is also ground-up corn) has a finer texture. Now what do you know that’s made of corn, but is coarser than cornmeal? That’s right, I’m talking about grits. Or polenta. Whatever, it’s the same thing. No, really! I’m serious! It’s all ground-up corn of various levels of coarseness; it’s just that grits are usually white, and polenta is usually yellow. For a really in-depth discussion, I’ll direct your attention to the transcript of the “True Grits” episode of Good Eats (please do note the “hominy” discussion by Mr. Alton Brown himself at the bottom of the page). But whatever you call it, most ground corn doesn’t make a terribly good bread on its own; this is why you mix in flour for the best cornbread. Cornmeal takes longer to absorb water than wheat flour does, mainly because of the larger size of the particles (when you look really, really closely at it). This bread solves that problem by cooking the grits/polenta first, resulting in a smoother, less (ahem) gritty texture. There’s no denying that corn and pine nuts are together a thing of beauty; but when you cook the pine nuts to a roasty brown in a little butter before mixing into a grits/polenta-rich dough, the two become elevated to extraordinary. This bread twists them together in a nutty, browned-butter singularity, which bakes into a delightfully toothsome loaf. 1. Mix the grits or polenta with 1 cup of the water in a small saucepan. Bring to a boil, stirring continuously. Reduce the heat to a simmer and cook for 2 to 3 minutes more, stirring occasionally to prevent scorching. Set aside to cool for 10 minutes, or until no longer steaming (120º to 130º F if using instant yeast, see note 1 below). 3. Cover the bowl tightly with plastic wrap, and let rise in a warm place for about 2 to 3 hours, or until it has doubled in size. 4. Melt the butter over medium heat in a small saucepan. Add the pine nuts and cook for a minute or two, or until just beginning to turn golden. Remove from heat, and let sit until cooled. If they begin to turn dark brown, remove to a bowl immediately to cool. 5. Reserving 3 or so ounces (about 3/4 cup) of flour, add the reminder and the salt to the grits/polenta dough. Mix with the dough hook on low speed until a rough dough forms. Slowly add the pine nuts and melted butter, scraping the bowl if necessary. Increase the speed to medium-low and knead until smooth and elastic, about 10 minutes. Add the reserved flour as needed to achieve a dough that clears the sides of the bowl, but is not too firm. 6. Remove to a lightly-oiled bowl, cover, and let rise in a warm place until doubled in size, about 50 to 60 minutes. Grease or line a baking sheet with parchment paper. Dust the pan with cornmeal. 7. Punch down the dough and turn it out onto a surface lightly dusted with flour. Divide the dough into two equal pieces. Roll each out to a rope about 16 inches long. Twist the two ropes together to form one long loaf, pinching the ends to seal. Transfer gently to the prepared baking sheet, and sprinkle more cornmeal over the top. Cover loosely with plastic wrap, and let rise again for 45 minutes. 8. Preheat the oven to 400º F. When heated, bake the loaf for about 30 to 35 minutes, or until golden brown. Cool on a wire rack before serving. 1. If using active-dry yeast, let the grits/polenta mixture cool to 105º to 115º F. Mix the remaining water, honey, and yeast together before mixing in with the flour. 2. Whatever you decide to call it, please use stone-ground grits or polenta. It’s not difficult to find, and the flavor is incomparable (long story short, the flavorful hull and germ of the corn are left intact by stone-grinding; this is not the case with metal grinders).